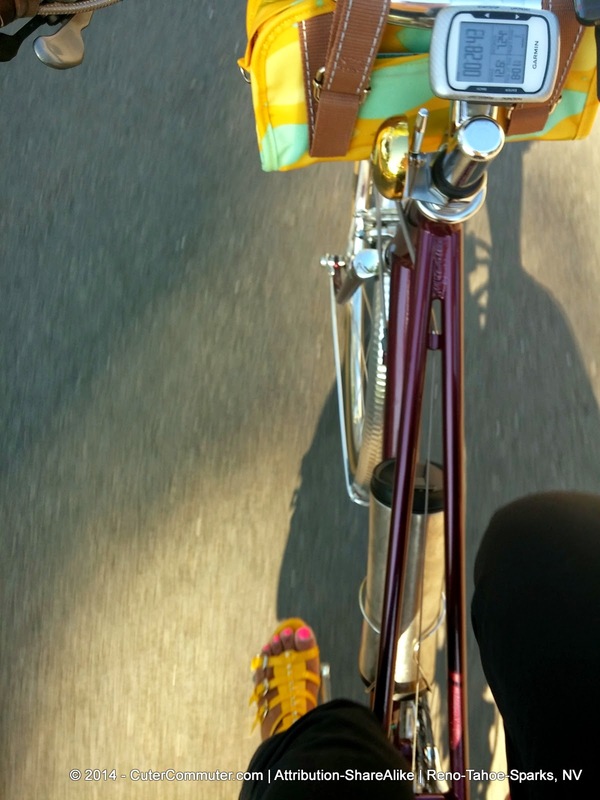 I carry most of the things I need from day-to-day in pannier bags that hang off the rear rack of my bike. Still, I needed a way to keep some things close at hand and if they're in my pannier bags...well, they're out of reach while I'm riding my bike. 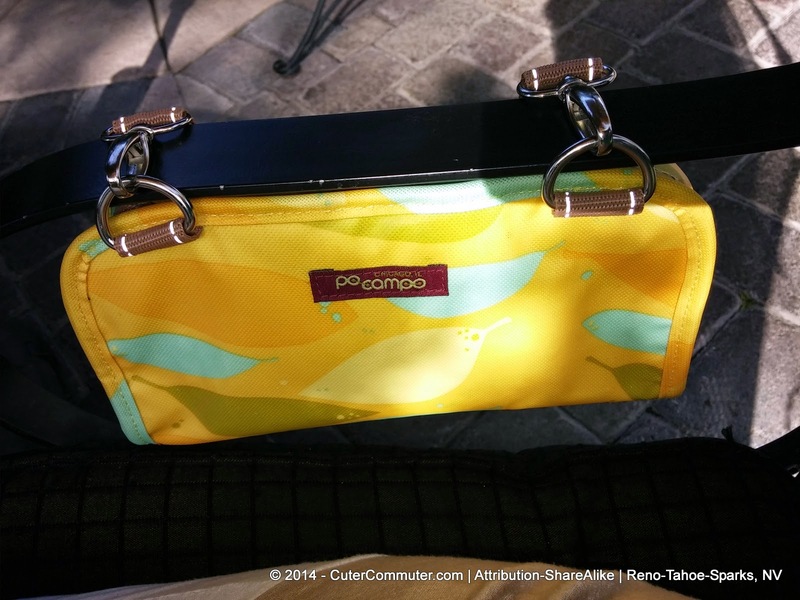 So I purchased this cute Six Corners Bicycle Handlebar Bag from Po Campo about a month ago. The one pictured in my hand is the Yellow Feathers Coated Poly design. The buckles detach, go around the handlebar and reattach in the same place. 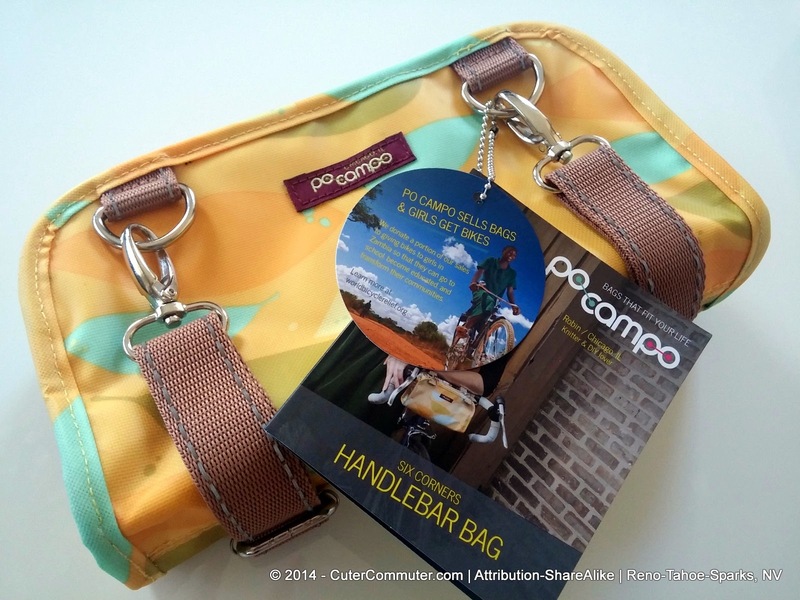 clasp, the bag attaches easily to the handlebar. Po Campo's video on YouTube has an attachment demo. When I get off my bike, it just as easily detaches so I can carry the things I need with me such as my wallet, keys, business cards and phone. Notice the straps have reflective stitching!! I carry it with me when I am off the bike, like to brunch!! Here it is strapped onto the arm of a patio chair. This way stays out of the way and off the table but cannot easily walk away. Strapped on the arm of a patio chair. On the back side of the bag is patch pocket that faces towards me when the bag is hanging off the handlebars of my bike. It is about 4 1/4" wide and 2 1/4" deep. I sometimes keep my business cards in there or pepper spray for easy access. It's not quite deep enough or wide enough to keep my phone (I am afraid my phone will bounce out of the shallow pocket when I hit a bump so I keep it inside the bag). 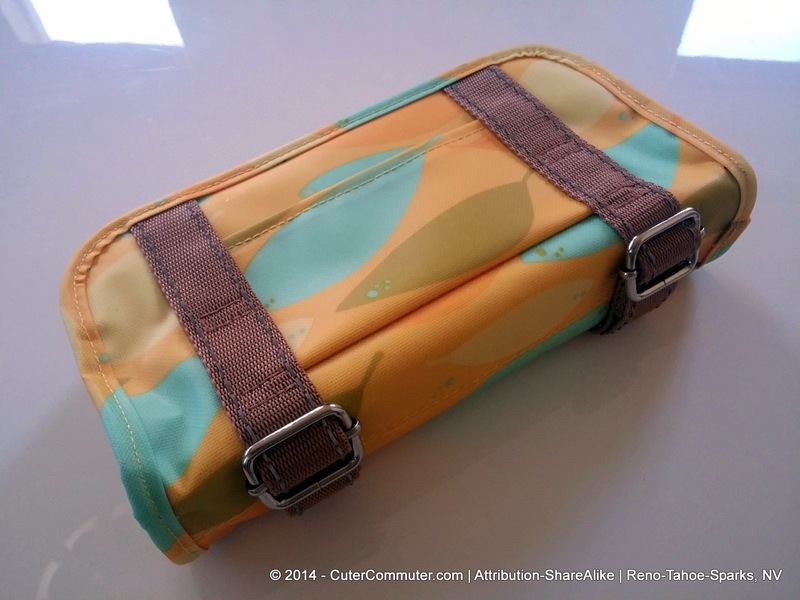 Here is a side view showing the patch pocket and zipper pull (the Six Corners bag has a zipper closure). The bag can stand up on its own although not very well. 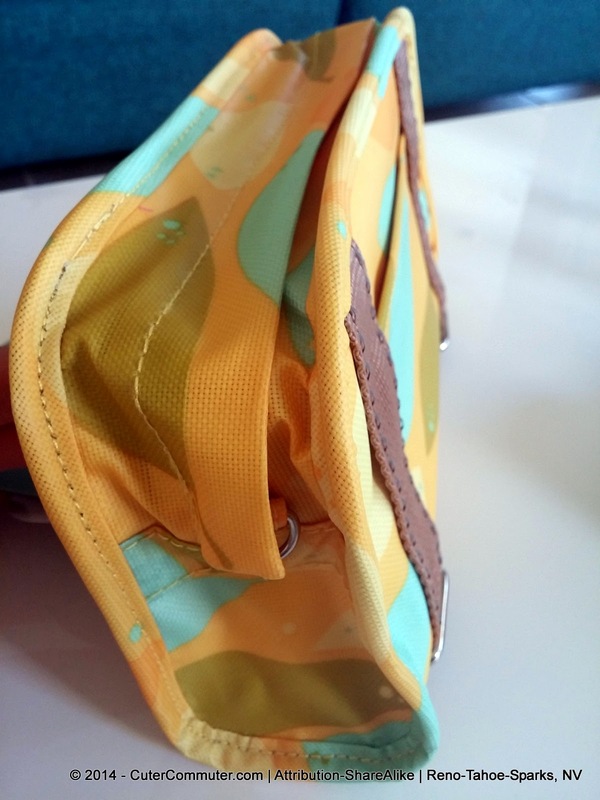 On the other side, you can see the zipper is protected by a sleeve so if I get caught in precipitation, it doesn't seep through the zipper and onto the contents inside. You can also see part of a D-ring to attach the matching cross-body strap which for some reason wasn't included in the shipping. 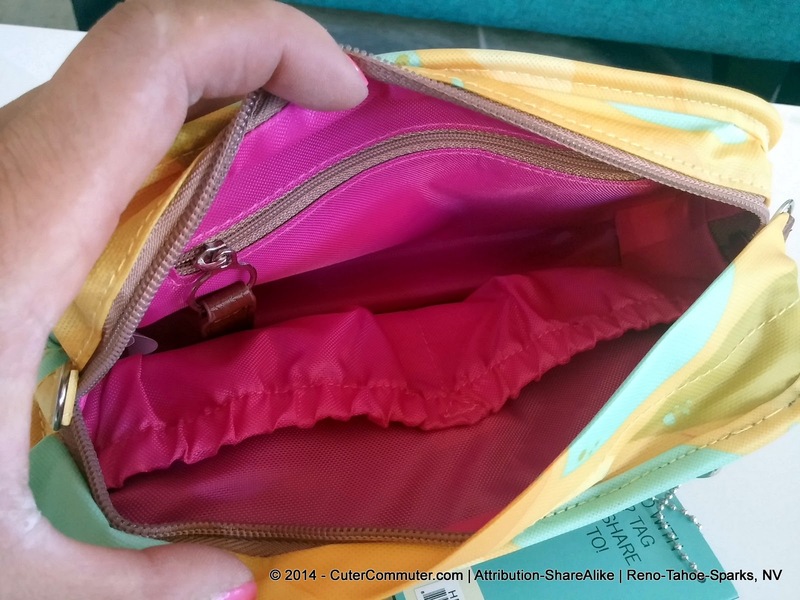 I like that the liner inside the bag is pink. It adds a pop of BRIGHT and HAPPY color -- and makes things easier to find. So many bags have a black lining. Sure, it may hide dirt better but it makes it harder to differentiate a black pen from a black eyeliner. 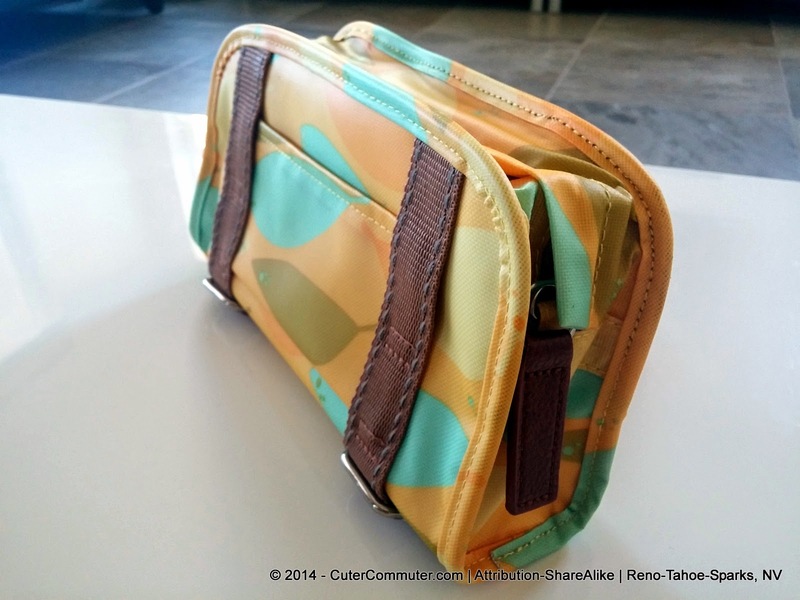 It has an interior zippered change pocket and two gathered (phone) pockets. But if I stand my phone in there (I have an LG-G2x that's just under 5 1/2" high) with the bag being 4 inches tall, my phone stands too tall for the zipper to close over it so I lay my phone down on its side. 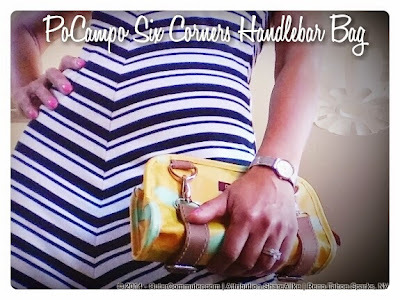 The Six Corners Handlebar Bag the perfect size clutch for me. It holds the essentials I need when I just need to carry a few things. It does have a lifetime warranty but I doubt that I'll ever need to send it back. It's built very well and should last several thousand miles while bicycle commuting! !